The Spot is a comfortable walk east of the University of New South Wales campus and is even closer to the Randwick Health campus. Those wanting to escape the blandness of campus food can find great international variety at The Spot at reasonable prices. And of course the Ritz cinema shows all of the first release movies in a cinema complex that ‘wraps itself around’ the patrons with its gentle heritage ambience. 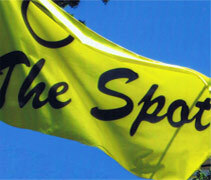 Sponsored by the Spot Business Association Inc. And Developed by SKIZCorp Technology.